After this was finished late Friday and I worked Saturday (and spent the evening with the hubby - after blogging, of course! ), I dove into the next project on Sunday. I couldn't help myself. 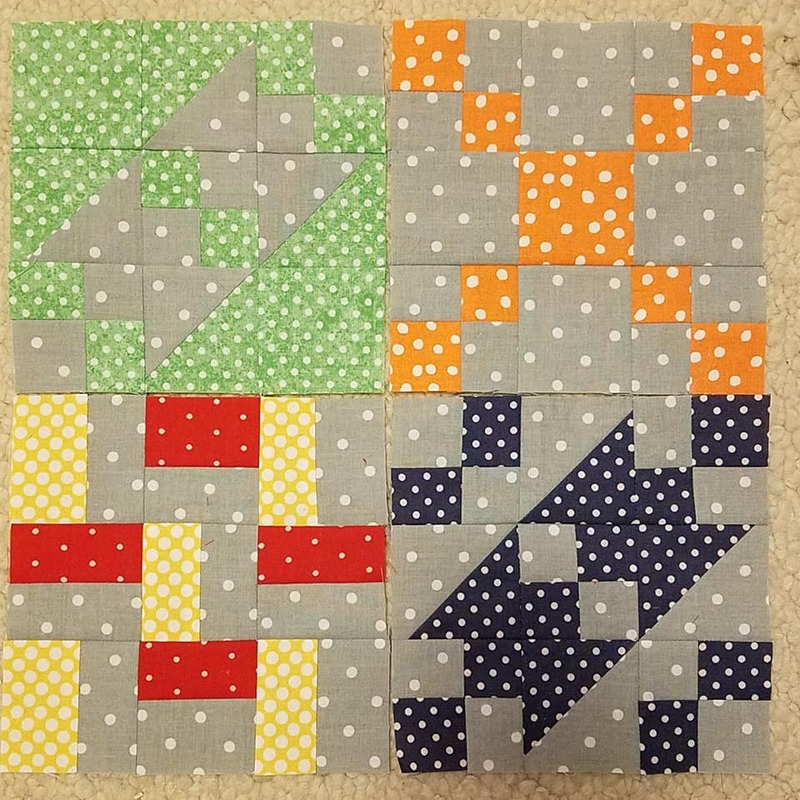 After figuring out the dot problem quilt idea, I couldn't stop thinking about it. I know I have a weakness for fabrics with dots on them. I tend towards them for many projects and have a good stash of leftovers. And for years, I'd thought about making a quilt with all the dot fabrics. But until this project came along, I didn't know WHAT I was going to make. So yesterday I made an effort to catch up. The first four. Well, most of the first four. Some of the designs are fairly similar and I didn't want to have too many that looked too alike. Maybe I'll add some in later, but we'll see how things go. To make them, I'm using the grey dot as a background (a fabric I found TWO 2.5 yard cuts of in my stash...I'd bought the same fabric twice and didn't even know it until I tidied up my sewing room a while back!) and going to the stash and pulling the first fabric with dots from that stack, down the line...red, then orange, then yellow...and back around again when I get to the end of the line. The fabrics I've pulled are going into a bin for later use because I'm sure I won't have enough to not repeat. Then again...I'm still not sure how many blocks I'll make! While I was working on these, Freddie was entertaining himself. I toss my trimmings into this bucket and, when full, tie up the bag to donate for paper-making. I replaced the bag and Freddie heard the noise and came looking. 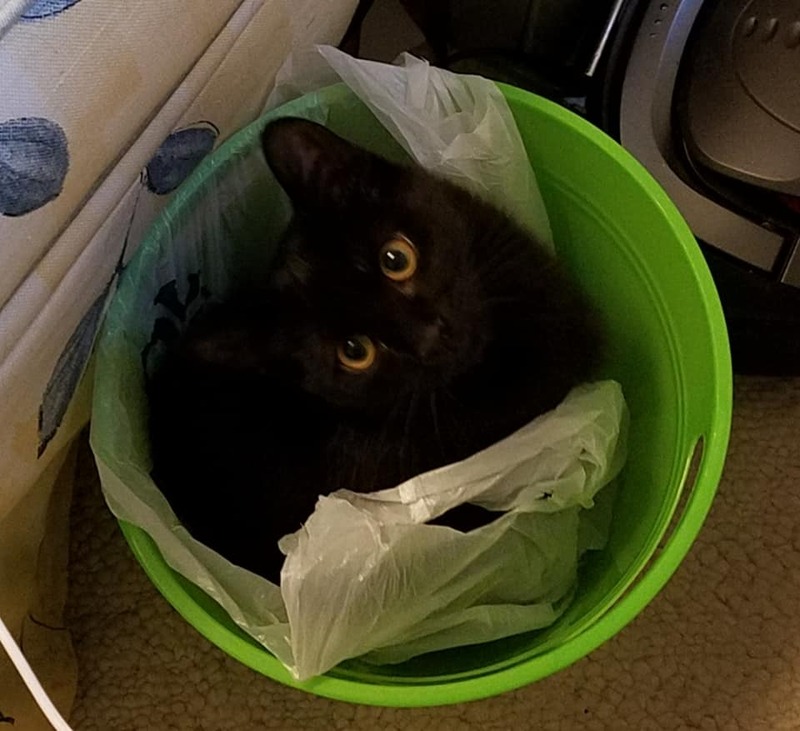 This was early...he wrestled the bag out completely, took that elsewhere, dumped the bucket over while climbing in it and then sat halfway in the upended bucket for a while. I took a break for dinner, but things were going so well, why not keep going? 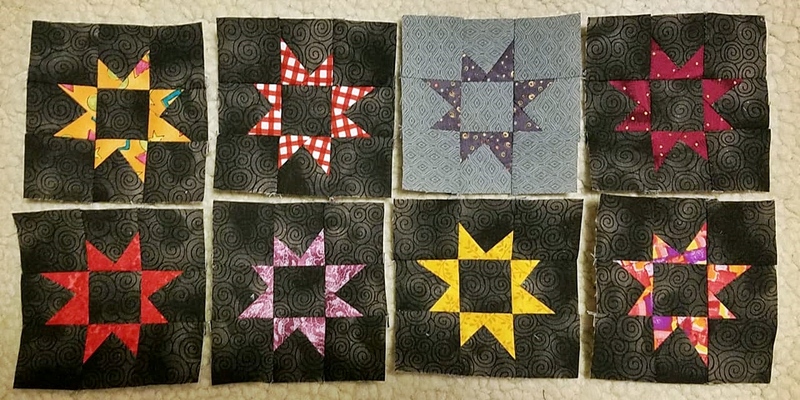 As leader-enders, I pulled out the tiny stars again! It was nice that their construction was working at a 1:1 ratio with the other blocks, so I was finishing two different blocks at a time. So not too many more in the grand scheme of things (needing 1,080), but progress! And fun to sew with my mom's stash this round. Your blocks look great!! I like how small tweaks in value and layout can really change the look of a block - so I made several "groups" with the same "units" - just for fun. And your tiny stars are adding up - you'll get there before you know it! I voted, too bad I can't give you all 10 votes! Your dots are looking great, I love dots, too! Your kitty is such a good helper and entertaining for us. He is a cutie. Those little stars are still looking so pretty. Let me know if you need more variety, I can send some scraps along to help! 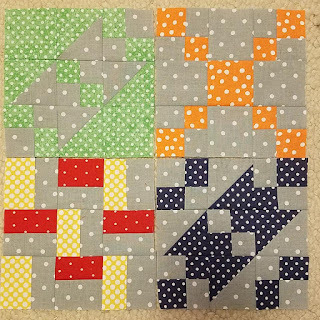 I have been collecting dot fabric to make a dot quilt someday. I started one and realized for my taste and the pattern that I had chosen, all dots were too plain for it. I think I used white on white for the background. I think I was using too many pastels, too. So, I started adding fabrics that had dots it in of any kind not strictly polka dots. For example, it might be a paisley with the dots in the print. I have not gone back to the project. 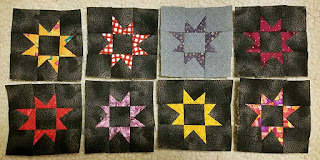 I'm thinking of a project with shirtings for the backgrounds and then flowers of dot fabrics appliqued. Of course, I haven't started that either. I was just thinking about getting out of my chair and looking at it. The pattern is for a twin bed and I want to make it queen. I can't just add more blocks as the blocks are offset and it would not come out right without cutting blocks into partials. Therefore, I had to resize the blocks. I was a math major and just couldn not think. It was not difficult at all. At that time I was still talking to my brother who was also a math major and knows nothing about quilting. Five minutes after talking to him, we had it figured out thanks to him and my verifying it from the quilt stand point. I'm enjoying seeing your blocks. It is an inspiration to me to do something with my dots. Thanks for posting and good luck with your projects even though you do not need luck. 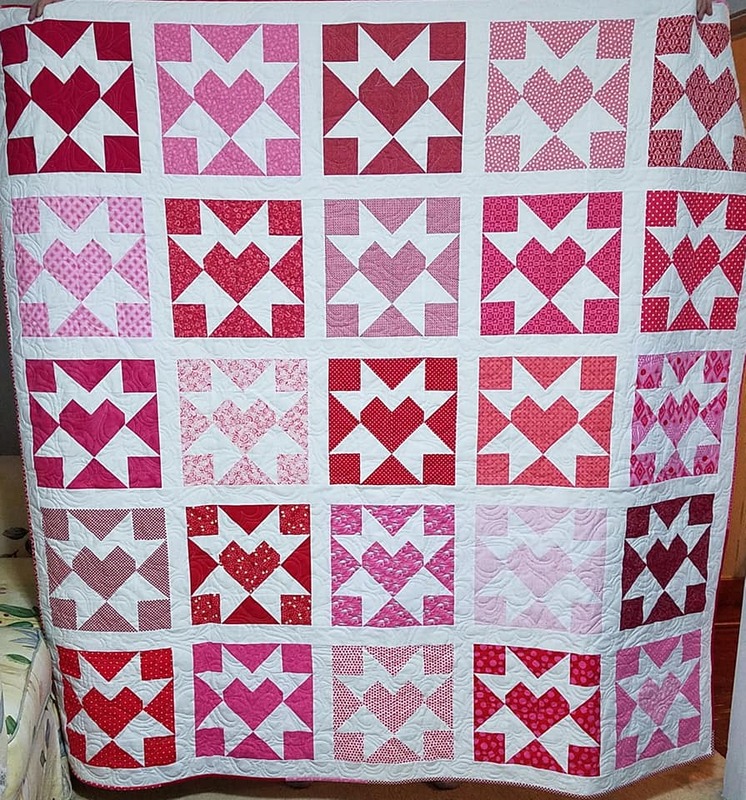 Needless to say, I've voted for your heart quilt; I love it! 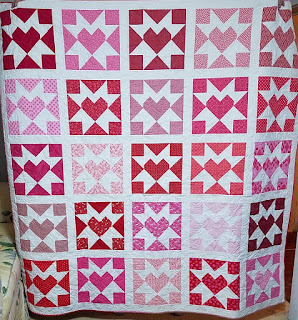 Your little dot blocks are looking too, and will make another pretty quilt I'm sure. I'll be watching for it! ---"Love"
You got my vote, and not just because I know you. I thought it stood out and it really was my favourite entry. 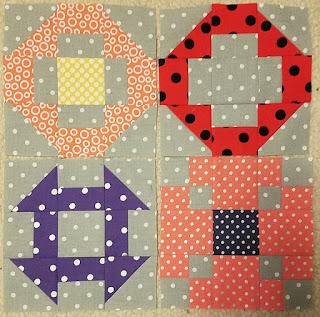 Looking forward to seeing the dot quilt. The blocks are pretty cute - almost as cute as Freddie. Freddie is just tooooo cute!! I voted for your quilt as well and love your polka dot blocks. You do have a lot of variety. I hardly have any even I do love them, but since I major in repros I just don't get many. Can't wait to see this project done. You are getting a lot done, as is Love! Way to go! !